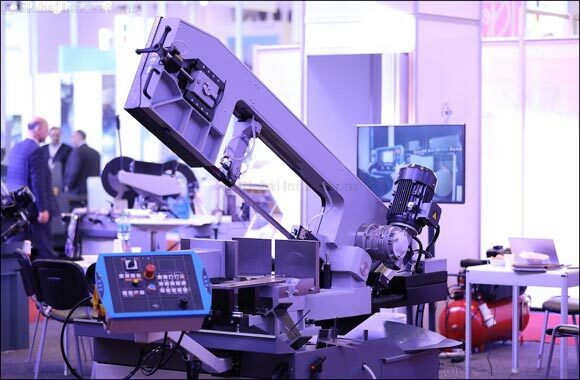 Sharjah - 16 January 2019: SteelFab 2019, the region’s premier metal working event, held 11 technical seminars during its 2nd day that discussed both automation and integration. The 15th edition of the exhibition is being held during January 14-17 at Expo Centre Sharjah. On its third day, SteelFab will hold 11 additional seminars, which will include technical presentations and live demonstrations, that focus on the most prominent global issues in the metal working sector, covering topics related to fabrication, metal-cutting, robotics, welding, grinding, surface preparation and software. Expo Centre Sharjah called on companies, factories, suppliers and technicians that operate in the metal working industry to visit SteelFab on Wednesday and attend the seminars, which will start at 10:30 am and will continue until 5:00 pm, to learn about global market trends and review the latest innovations in this field. HE Saif Mohamed Al Midfa, CEO of Expo Centre Sharjah, stated that the specialized seminars, technical presentations, and live demonstrations of the latest technologies and solutions are no less important than the exhibition itself, given the information they provide on the developments of the global metal working industry. He added that these seminars benefit manufacturing companies in the region that seek to enhance their competitiveness, develop their performance, improve their quality, reduce their costs, and increase their production while also preserving the environment. Al Midfa stated that the UAE’s adoption of a policy of economic diversification, and its plans to raise the manufacturing sector’s contribution to the GDP from its current rate of 14% to 20% by 2021, is an important factor contributing to the continuous development of this event, which attracts exhibitors looking to capitalize on the growing demand from key sectors of the industry in the UAE and the region, primarily in the sectors of construction, manufacturing, infrastructure, oil and gas, pipelines, food production and others. Anyone wishing to view the topics of the seminars can visit the SteelFab website at www.steelfabme.com. Admission is free for all trade visitors, and the exhibition is open from 10am to 7pm daily. The 15th edition of the event, which is organized by Expo Centre Sharjah with the support of the Sharjah Chamber of Commerce and Industry, brings together more than 300 companies, representing some of the world's leading manufacturers and suppliers that are showcasing the latest innovations belonging to more than 1,000 brands that specialize in Welding, Cutting, Grinding, Pipe and Tube Machinery, and other technologies and solutions.